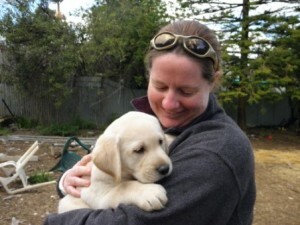 Ashley Howland lives in Adelaide, South Australia with her husband Ross, two daughters, Maddy and Aijay, and her spoilt Labradors Stitch and Chewie. Her girls inspire her every day to write children’s books. Stitch, Chewie and her previous dog – Obi often provide the material. Ashley also works as a primary school teacher, specializing in Physical Education and Science. I am inspired everyday by my two girls. We write lots of stories together and of course every day is a new adventure. Our dogs are also a great source of inspiration. Their crazy actions help with the material. All of this and my students at school help to give me great ideas and encourage me to keep writing. I love sharing my stories with young people. One of my passions is writing with young people it is so amazing to see their ideas come to life. I use One Note to plot and record ideas. This is a great way to ensure I never lose any potential story. Once I have a basic idea I might try and dot point some chapter guidelines. I don’t always do this, but it can help keep the story on track. I also record any research on One Note too. Keeping everything in one place helps. Once I think the story has enough guts to begin I write a skeleton draft. That is basically the most simple story I can. It’s just to get the first draft done, because you can’t do anything without a first draft. Once that is complete I can go back and add all the new stuff to make my story come alive. I think my characters bump around in my head. I have them buzzing almost constantly. Yes at times we do have a conversation or two… or argument! That’s part of the fun. Just remember to record notes about theses interactions – it will help make that character more whole later. I generally build my stories around a character or two that invade my creative mind! Stick at it. It is never easy and rejection can male life hard. Be as professional as you can, ask for feedback, have your story edited, assessed and read by other people. It is so important to take on board what other people say. You don’t have to take everything as gospel, but use all conversations about writing to make you a better writer. Writing is a journey that is life long, it is something you can always improve and should always enjoy! My first three books were originally published through a small firm. They were fantastic and I learnt a lot through this process. I have since republished them all myself and am now self publishing. I did this because I want complete control over the whole process. Of course if a large publishing house liked my books I would go with them, but for now I just like controlling my own destiny and sharing my work with others. My advice – learn as much as you can from other authors and beware scams. It should not cost you to publish your book (editing, illustrations and covers are different). Just careful! I’m really excited about the whole thing. It’s great that you can self publish and lots of Indie authors produce quality books. There are some that are terrible, but there are some terrible best sellers out there too! What is fantastic now is you can go it alone and the opportunities are completely in your own hands.